It was Wednesday 25th November 2015. An ordinary chilly Octobers Wednesday with extraordinary, chilling circumstances. My morning started off as usual: up at six, eat some soggy, over-milked Weetabix before work at seven. See the day out. Or so I planned. Waking up that morning, I felt just fine. It was a normal day. Squinting my morning eyes, I open my condensation lined Velux roof light and looked out across the sloping, picturesque fields that surrounded our Rainford home. Much like my life at that point, all I could see was a wash of white fog sweeping across the landscape, obstructing the truth. Today I’d be working on a home extension a mere stones-throw away from home in Rainford, St Helens. It couldn’t have been more than 300 seconds drive from my house and my old stomping ground, Rainford High School. The road we were working on was a very familiar one, for when I was at school, a few of my mates and I used to get out of school at dinner time –legally, of course– and head down this quiet, horseshoe shaped road to the Chinese chippy in the village – a privilege supposedly only given out if you lived in Rainford. As the temperature hadn’t yet dropped below 5 degrees, I’d opted to wear my grey builder’s shorts that were rolled up at the knees, a grey, slim fitting T shirt with the company logo embroided on and a gunmetal grey softshell jacket- again, with the company logo on. On my feet I wore these dust covered, black leather boots that made me look a bit like Chris the clown, what with my scrawny legs and slender ankles. Dull clothing for a dull day. By early afternoon, all muscly stiffness had worn off, bar one part of my body: my left leg. For some reason I couldn’t seem to shake it. I had this straining ache giving me grief and, for the past few days, the other work lads had noticed I’d developed a faint limp. I had no other reason to believe it was anything other than the on/off golf injury that’d been lurching around for the past few months. 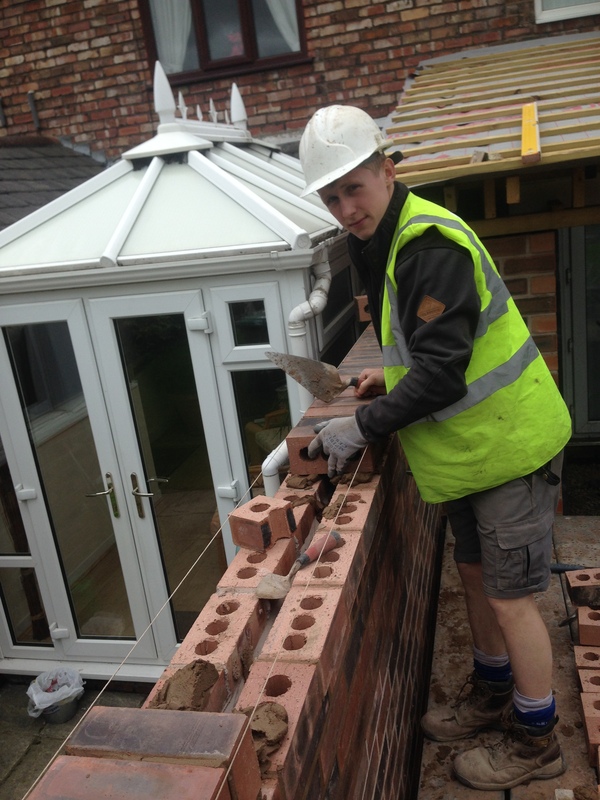 Summer 2015 – Working as a bricklayer in my family business. Come mid-afternoon, I’d pretty much completed my main tasking for the day. Our structural work was more or less done and now, there was a collection of left over materials that needed loading onto the wagon for disposal off site. Knowing how to stack a flat back wagon properly, I figured it best to get rid of the big bulky stuff first. I spotted some timber; a fairly long length of cumbersome 4 x 3 wall-plate. I bent over, picked the thing up and plonked it on my right shoulder, balancing it carefully before walking off. As I walked down the side of house to the wagon at the front, I could feel my body- namely, my leg –struggling to cope with the added weight and stress the load placed on my frame. It wasn’t even that heavy either, which got me thinking ‘what’s all this about?’. Continuing on, whistling as I went, I reached the side of the wagon and slowed to peer over the side for space to dump the timber. There was a space round the other side of the wagon, but I’d have to walk round the back and onto the road to get there. Luckily we weren’t on a busy road so it wasn’t a problem. I continued on down the side of the wagon, balancing this piece of unused 4 x 3 on my bony shoulder. One step. Two steps. Three steps. I turned to the left, swinging the timber round to walk between the back of the wagon and the front of the other smaller van we had parked up behind it. With my left boot first, I stepped off the kerb, my heel hitting the tarmac to take the weight. I started wobbling and for a brief moment life paused as if the earth had just stopped spinning. I felt my knee bending and my calf muscle and Achilles tendon contracting desperately to stabilise. My knee continued to bend past 90 degrees as I began to fall to the ground. Instinctively, I grabbed whatever I could with my left arm whilst keeping hold of the timber with the right. SMASH! My left knee impacted the ground heavily firing a 9.9 magnitude earthquake up my thigh and into my back. Then, a shower of pain. ‘’ARRGHH. F*CK, F*CK, F*CK!’’ I screamed, tensing all 43 facial muscles in sheer agony. I gritted my teeth and closed my eyes for a brief second trying to stay calm. The timber clattered a hollow drum as it hit the solid tarmac and flung off my shoulder into the middle of the road. A split second later the adrenaline kicked in, speeding angry bursts of the hormone deep through my central nervous system. Without thinking, I got up off the floor and started hopping around, throwing a few more swear words here and there across the quiet village road. I looked around. Had anyone even noticed? Seemingly not. The pain continued increasing if ferocity, sinking its teeth deeper into my damaged left knee. I looked down at my knee. Nothing. There wasn’t even anything to look at other than a few loose road chippings stuck to my knee cap. I stood for still for a minute holding onto the wagon as I felt my face turn red with the overdose of pain. I started to feel dizzy when all of a sudden I heard a horrible noise: a car engine. I looked up wearily to my right to see a silver car in transit down the road. ‘’For f*cksake! !’’ I exclaimed. ‘’Now I’ll have to move the timber out the road’’. I hopped a few steps away from the wagon and bent down to grab a-hold. Through excruciating pain I somehow got a grip and rose to my feet once more. As I started dragging the timber across the road, Mark and Mick came running out, with Mark taking the timber off me and out of the road. With eyes bulging and worry written all across their faces: ‘’What’s ‘appened?’’ they prompted simultaneously. ‘’I’ve just stepped off the kerb and me’ leg just went’’I replied through gritted teeth. I sat down on the ground for a minute, my heart racing and my breath gasping through thin air as I did so. Mark and Mick were asking me questions but it was all just white noise. I was stuck in a state of shock and didn’t know how to escape. A few minutes passed then the lads helped me up and into the driver’s side of the smaller van parked behind the wagon. ‘’Just have a rest for a few minutes, alright’’ Mark said. I nodded in agreement. A few minutes went by before I decided I would go home. The lads politely offered to drive but I stupidly refused, claiming ‘’I’ll be alright, I’m only up the road’’. With that I started the engine and the van came to life. Only up the road, I thought. How hard can it be? Minutes later, I got home after a pain filled drive up the road. Hobbling out the van and down the side of the house, I felt my heart slow and the adrenaline drop away a little. I opened up and walked in with my dusty boots and dirt covered work clothes. The house was spotless, but right now, I couldn’t of given two sh*ts anyway. I wasn’t stopping to take my boots off. I went straight for the Jacobs cracker box – not for the crackers, but for the painkillers in there. I spotted some tramadol – the Porsche of the prescribed drugs world – I had left over from when I had kidney stones 11 months earlier. I figured I could justify taking such golden drugs at a time like this. 30 minutes later my pain started to ease and a burden of fog was lifted from in front of my eyes. Something had gone seriously wrong, and I didn’t even need to persuade myself that I needed urgent help. Thinking I’d done my ligaments and not knowing where to start, I booked a private osteopath for the following day. What now? I could only wait and see tomorrow. MY CANCER IS STABLE – WHAT NOW?